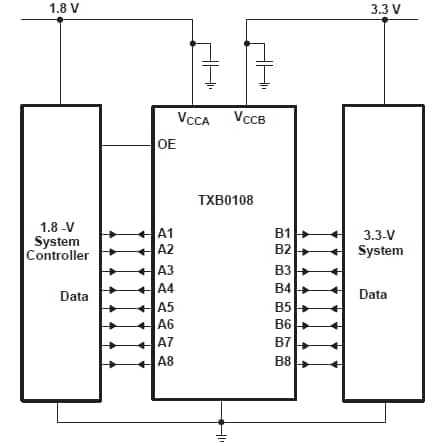 The TXB0108 8 Channel Bi-directional Logic Level Converter is useful for interfacing sensors or 3.3v logic components with 5v logic level microcontrollers. This unit will do the level shifting required to allow theses device to communicate without any damage occuring to the devices. On the right side Vb is the input voltage reference of 5v, whereas Va and OE is the input reference of 3.3v. The common ground is applied to GND and B1 to B8 will serve as digital input 5v to be converted into 3.3v from A1 to A8 or vice versa. 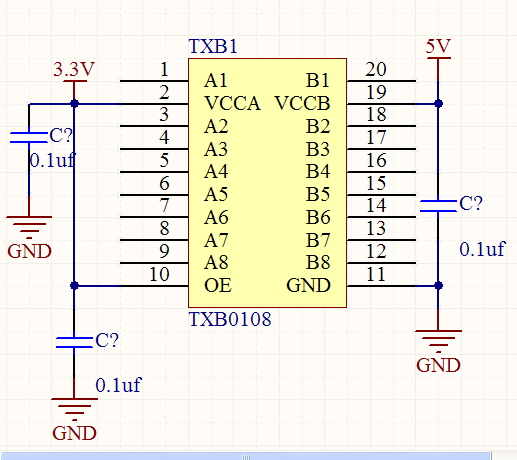 This 8-bit noninverting translator uses two separate configurable power-supply rails. The A port is designed to track VCCA. 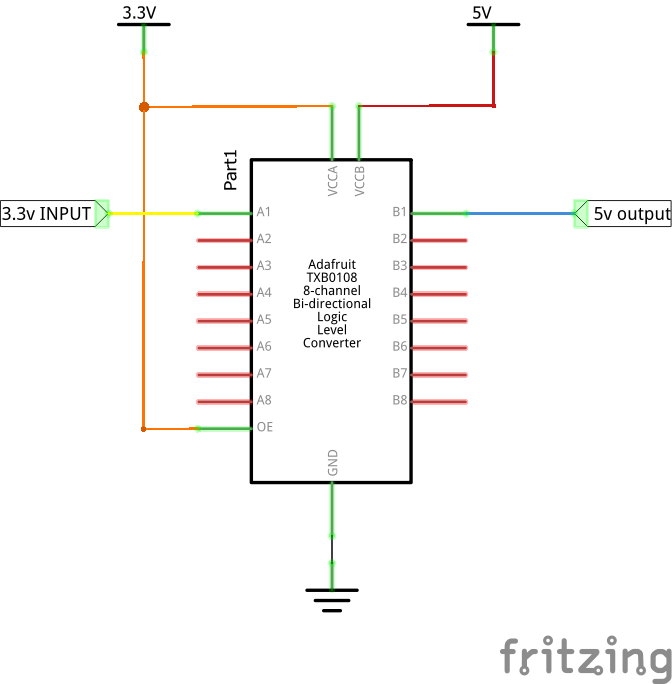 VCCA accepts any supply voltage from 1.2 V to 3.6 V. The B port is designed to track VCCB. 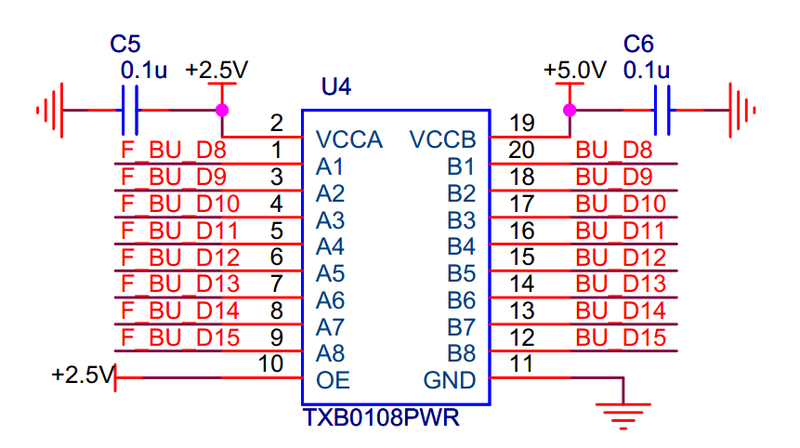 VCCB accepts any supply voltage from 1.65 V to 5.5 V. This allows for universal low-voltage bidirectional translation between any of the 1.2-V, 1.5-V, 1.8-V, 2.5-V, 3.3-V, and 5-V voltage nodes. VCCA should not exceed VCCB. 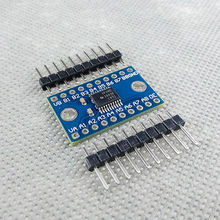 This is not recommended for I2C conversion and it is also designed to positioned close to the devices you are needing to convert to and from.